Tech startup dealmaking by insurance firms including AXA, XL Catlin, MassMutual, and others is on pace for a record high in 2016. Carriers are no longer shying away from insurance tech. As more insurers including Aviva, XL Catlin, and Guardian Life launch investment arms, tech startup dealmaking by insurance firms is on pace for a record high in 2016, according to CB Insights data. 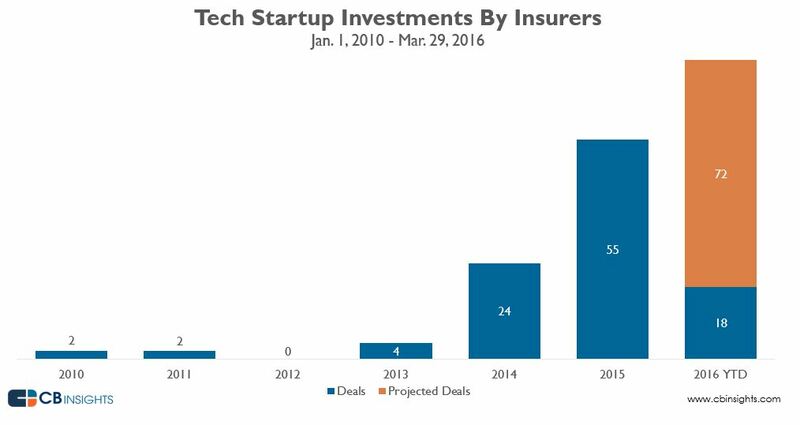 In the first three months of 2016, insurers completed nearly 20 deals. The same set of insurers completed just 8 deals over the same period last year. Interestingly, while insurers previously shied away from tech startups working directly in the insurance value chain, 2016 has seen several strategic investments by carriers into insurance tech startups. These deals include XL Innovate’s investment in Slice Labs, a startup aiming to provide on-demand coverage for ride-sharing drivers and home-sharing owners; Intact’s investment in per-mile insurance provider Metromile; and MassMutual Ventures, Transamerica Ventures, and AXA Strategic Ventures’ investment into insurance-comparison portal PolicyGenius. Below are a handful of the largest tech deals in Q1’16 that included a strategic insurance investor. Looking for more insurance tech data and analytics? Check out the CB Insights Venture Capital Database free.